Welcome back to this week's edition of Digital Digest! Summer is here, but we're not slacking off. In addition to our regular news, we have another double feature for our reviews this week, with reviews of Missing - The Complete First Season and Mannix - The Seventh Season. Let's get going! The big announcement this week has been "Blu," as Warner Home Video has announced that once again, they'll be releasing the series Friends... but this time on Blu-ray! On November 13, the entire series will come out in one big chunk as an ultimate 21-disc Blu-ray set, with every single episode presented in high definition. The set includes over 20 hours of special features, three of which have never been presented on any previous release. We've got more news this week, which brings us closer (but not quite all the way) to completing the 2011-2012 seasons of ongoing series on home media. We start with the Universal series, as we have more definitive details on those. Universal treats us with a double feature on September 4 with releases of The Office - Season Eight (DVD, DVD/Blu-ray/Digital Download Combo Pack) and Parks and Recreation - Season Four (just on DVD, sorry!). The Blu-ray release of The Office, as suggested above, is not JUST a Blu-ray release this time, but includes the DVD and an Ultraviolet digital download this time. It seems, though, that Universal has chosen to place the DVD and Blu-ray versions on the same discs utilizing double-sided discs, a standard which Universal seemed to have abandoned some time ago (but obviously it isn't gone for good, it appears). While it is already available to preorder, there is still no date for 30 Rock - Season Six, but most likely we'll see it just before the final season begins (since it will be a midseason replacement in the 2012-2013 season). TVShowsOnDVD.com has come across some release dates for some series from 20th Century Fox, courtesy of listing dates provided on Amazon.ca (Amazon's Canadian outlet). We should stress that these dates are unofficial, and subject to change... but generally speaking, Canadian release dates are the same as release dates in the United States. On September 18, you can find Modern Family - Season Three (DVD/Blu-ray) in retailers. How I Met Your Mother - Season Seven is scheduled for another "legendary" release on October 2. Moving over to Fox animated series, Family Guy - Volume Ten is set for a September 25 release. Surprisingly, they are not trying a Blu-ray release for this set... at least not yet. And moving all the way into December, Fox has The Simpsons - The Fifteenth Season (leaving the series with seven seasons still not yet released... the pacing of this series seriously needs to be picked up a bit) on December 4, and Futurama - Volume Seven on December 18. Both releases will be on both DVD and Blu-ray. Amazon.com announced some new additions to their Amazon Prime streaming service last week, this time coming from the MGM library. While the announcement for the deal mostly discusses movies, it does include some TV series from the MGM library. The only series which we could find that are included in this deal so far, though, are thirtysomething and series from the Stargate franchise. Hopefully as this deal "develops" over time, we'll see more MGM TV series appear on the service for unlimited streaming, such as Green Acres, Cagney & Lacey, Fame, and more. Those series are, in fact, already available to purchase as streaming video from the website, but are NOT included in the "all you can watch" Amazon Prime plan (which costs about $80 a year, unless you are eligible for one of their discounted flavors of the service). We'll let you know if more comes out of this. Finally, we have been covering a lot of news lately about the in-demand actress Christine Lakin, including our recent story with the actress on her latest endeavor Worst Audition Ever. You'll be able to see much more of her coming up starting July 16 on Hulu, with her own webseries mockumentary, Lovin' Lakin. The "mockumentary" focuses on her rise from child star to a working actress in Hollywood, where she provides insight on how to make it there. There is an intro trailer available now where fans can preview the comedic webseries, which will feature guests including Kristen Bell, Patrick Duffy, Kristin Chenowith, and Seth MacFarlane. We will have much more on this webseries in the coming weeks! Tuesday (June 26) brings to DVD the Warner Archive release of Night Court - The Complete Sixth Season. It isn't available to order yet, but it will be on Tuesday morning. Also, Lionsgate has Meet the Browns - Season 6 (Episodes 101-120). We will have a review of this set soon. How far would you go to save the one you love most? 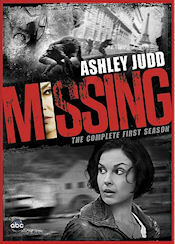 Emmy Award Nominee Ashley Judd stars in Missing, ABC's thrilling series that aired this past season, bursting with international intrigue and a full season of brilliant twists and turns. After Becca Winstone's son disappears while overseas for a summer internship, she takes it upon herself to travel to Europe to track him down. It soon becomes clear that Becca is no ordinary woman, but a former CIA agent deactivated after the devastating death of her husband. If she wants to find her son alive, Becca will have to rely on old friends...and old enemies...thus reopening old wounds. Her resourcefulness, skill and determination will be put to the test – but a mother's love knows no limits. ABC's inspiring, action-packed drama grabs you from the very first minute and never lets go. This season one DVD set includes exclusive bonus features, plus interviews with star Ashley Judd and the show's creators, all on a three-disc DVD set. The season stars Ashley Judd as Rebecca "Becca" Winstone, Sean Bean as Paul Winstone, Cliff Curtis, Adriano Giannini as as Agent Dax Miller, Nick Eversman as Michael Winstone, Tereza Voriskova as Oksana, and Adriano Giannini as Giancarlo Rossi. However, there are many recurring stars such as Aunjanue Ellis as Mary, Laura Donnelly as Violet Heath and Keith Carradine as Martin Newman. Other guest stars include Karel Roden as Victor Asimov and Nikola Navratil as Maxim Asimov. The series aired for 10 episodes this past season and didn't deliver in the ratings in the key 18-49 demo despite a decent total viewer count. Thus, ABC canceled the series in May. The series is being shopped to other networks to try to continue. I think ABC should have brought it back as a summer series. It is good fun. Anyway, as for this set, there are many memorable episodes in this suspenseful juicy series. All ten episodes have to be seen in pretty much order as they are all connected. The series starts off with the episode "Pilot," where Becca Winstone's son Michael Winstone goes to Europe for an architecture program, but when Michael doesn't call home in over a week, Becca Winstone goes to Rome and she finds out that he was kidnapped, so as she was a former CIA Agent, she is going for a hunt. In "Ice Queen," with Becca still on the hunt to find Michael, her best friend, Mary, complicates matters with her surprise arrival in Europe, while Michael struggles to uncover answers behind his kidnapping. In "Tell Me No Lies," Becca is reunited with her CIA mentor, Martin Newman, and they join Dax Miller in trying to find the assassin who killed Paul, also Michael gets a severe warning about what happens if he tries to escape. In "Measure of a Man," Becca is forced to recall details of a traumatic former case in order to prove her innocence now, while Michael goes to new lengths to protect himself and Oksana. On the finale, "Rain on the Evil and on the Good," in a last-ditch effort to save her son, Becca faces her inner demons, while Suspect Zero tries to finish his sale. The DVD comes in a case held by an outer thin box. The thin outer box is in black with a very cool shot of Becca Winstone on the bottom and has a nice shot of Paris on top with the series logo in the middle and the complete first season mention below that. The back of the thin outer box has info on the set and series, with a nice quote from Keck from TV Guide. We have a nice shot of Becca leaving an explosion along with four cool episodic photos. There is also a box showcasing the bonus features as well. When we remove the outer box, we get to the case. The case has the same artwork as the thin box, both cover and back, so everything is the exact same. Inside the case we have a nice shot of Becca on the left panel and like five episodic images on the right panel. There is also a disc-by-disc breakdown below the photos on the panels listing episode titles per disc. As for the discs themselves, disc one is on a little plastic holder that you can flip like a page in a book. Disc two is on the back of that little plastic holder, while disc three is on the right panel itself. All three discs are in the black and red design with the series logo and a character. Disc one holds episodes 1-4 with an image of Becca, disc two holds episodes 5-7 with a shot of Paul and disc three holds episodes 8-10 with a shot of Michael. There is also an insert booklet showcasing other ABC TV DVDs that are coming soon like Once Upon a Time and Revenge, and it is placed on the left panel. The menu design is well designed! We have different pictures and we have background music from the show playing. Before the main menu, we have auto trailers. On disc one we have trailers for ABC TV DVDs coming this summer and fall, Castle Season 4, and the theatrical movie The Avengers. Disc three has trailers for more ABC TV on DVD and the upcoming Odd Life of Timothy Green. Back to the main menu, the options are: Play All, Episode Selection, Bonus Features, Set Up and Sneak Peeks. Sneak Peeks is only on disc three and has the same trailers as the auto trailers on disc three. Set Up gives us the option for subtitles in English, French, Espanol, and Portuguese. You can also register your DVD here. Bonus Features is just on disc three and lists what is available, while Episode Selection gives us an episode number and title. All this is sort of similar to other recent ABC TV DVDs like The River. Video and audio quality are both outstanding, similar to other recent ABC TV DVDs we have reviewed like Scandal. We have Digital Dolby 5.1 surround sound and it is perfect. For the video, we are in widescreen (1.78:1), enhanced for 16x9 televisions. It is excellent quality but that is expected for newer/current series. As I keep saying, if anything goes wrong with audio/video for current series, then there is a major problem. Each episode has 8 or 9 chapter stops, so it is easy to jump through an episode if you are looking for something in particular. Nothing out of the ordinary here but it is all perfectly done. There are some special features on this set as well! They are all on disc three. First up, another is the featurette "Missing: In Action" (16:01). Viewers get a look at the genesis and production of this international project. It's a very good and informative featurette and has interviews with Ashley Judd, Greg Poirier (creator/executive producer), Gina Matthews (executive producer), Grant Scharbo (executive producer), Nick Eversman, Nikola Navratil, and Lukus Katakaliois (stand-by props). Then we have a second featurette, the best one on the set, and this one is called "On Location: Inside Istanbul" (32:35). On this one, we will get to see firsthand what it takes to shoot an international television production when the cast and crew show how they broke language barriers and borders on location in Turkey for 12 days to wrap-up the season. Interviewed are Grant Scharbo, Nick Eversman, Gideon Amir (unit production manager), Greg Poirier, Miro Gabor (second unit director of photography), James Strong (director), Dale Wyatt (dialogue coach), Tereza Voriskora, Lukus Katakaliois, Kenny Bates (co-producer), Frauk Ozerten (producer, Istanbul), Cliff Curtis, Keith Carradine, and Rudolph Urba (flight coordinator). And finally we even have some Deleted Scenes that run about 6 and a half minutes total! Now fans can delve further into the mystery with seven never-before-seen deleted scenes that include: Standard Delivery (from episode 110, 0:40), Red Tape (from episode 101, 1:07), No Escape (from episode 106, 0:32), No Better Adventure (from episode 106, 0:32), Close Call (from episode 109, 0:34), Lock Up (from episode 110, 1:50) and Cornered (from episode 110, 0:25). This is a nicely done set for a series that ended. It's a quick turnaround like for other ABC TV DVDs that came out in May and June! The series just aired its series finale on May 17 and this DVD was released on June 12! Unfortunately ABC canceled it at their upfront in May, so it will not be returning. Hopefully someone can revive it. As for the DVD, it is well done and similar to previous ABC TV DVDs. We get great audio/video, menus, packaging and special features. I think the special features are adequate for something with only 10 episodes. The Istanbul featurette is superb and well produced. Really liked that one. And we got deleted scenes, too! All that was missing really were audio commentaries though, like The River DVD had. ABC Studios knows how to make good DVDs, especially for their current series. Even though this show is done, you should still "see what you've been missing" (pun intended). If you only watched the pilot or one more episode, you need to watch them all because like more series, it got better. That is why I don't understand viewers these days. They only try one or two episodes and then give up. If it was like that in the old days, then shows like Cheers and Family Ties would have been long gone. This show was just good fun. Nothing Emmy worthy, but it has plenty of action and network TV is missing that right now. What other show on network TV films internationally actually? So see what you've been missing and try Missing...it's only 10 episodes and there is a satisfying ending to this "chapter." Joe Mannix is the straight-talking, straight-shooting private eye who was a fixture on television in the late '60s and early '70s, and now, we get more of him on DVD with the release of Mannix - The Seventh Season! The six-disc set from CBS DVD brings 24 more episodes of the classic series not only to DVD for the first time, but also to many fans for the first time. Yes, many diehard fans of the series who did not watch the series during the original airing will be seeing something "new" with this DVD set, as there are 16 episodes (that would be 2/3 of the episodes) included in this set which have not been included in American syndication packages. The season begins with "The Girl in the Polka Dot Dress," where Mannix has to determine if a woman with clairvoyant visions is a fraud or can actually prevent a future murder. Joan Van Ark guest stars. In "A Way to Dusty's Death," Mannix gets mixed up with a corrupt police chief while searching for a friend's missing son. Mannix is rescued by an escaped convict when his plane crashes in "Climb a Deadly Mountain," but the guards want that prisoner (and anybody he meets along the way) dead. Mannix follows the trail of clues after a newspaper columnist is shot in front of his own daughter in "Little Lost Girl." Mannix takes down a gang in "The Gang's All Here," so now the rest of the gang wants to take down Mannix. In "Desert Run," a pilot goes missing and Mannix is begged by his wife to find him... but things get muddied up when he finds the pilot had two wives. A relaxing fishing trip leads Mannix to a house of professional hit men in "Silent Target." In "A World Without Sundays," a mobster's girlfriend and a retired football star are entangled in the murder of a young woman's roommate. Mannix has to find out who wants to murder an opera star (and try not to fall in love with her in the meantime) in "Sing a Song of Murder." Finding jewels can help Mannix find an assault suspect in "Search in the Dark." In "The Deadly Madonna," a legendary actress (played by Anne Baxter) is about to make a comeback, that is if she isn't murdered first. Mannix is kidnapped at the airport in San Francisco in "Cry Danger." Plane crash survivors are a target for murder in "All the Dead were Strangers," and Mannix must find out why. In the two-part episode "Race Against TIme," Mannix has to get a Latin American revolutionary in and out of America for critical heart surgery... without getting him killed by factors other than his heart. Mannix tries to remember what leads to a near death situation (don't worry, Mannix can be shot infinitely many times without dying!) in "The Dark Hours." In "A Night Full of Darkness," Mannix is out to find out if an investigation of a mob boss caused the assault that killed Lt. Malcolm's new bride. Mannix has to prove the innocence of an accused gunman in "Walk a Double Line." In "The Girl From Nowhere," Mannix wants to find the identity of an unknown little girl who was a murder victim. Lucille Benson (you may not know the name, but you definitely know her face when you see her) guest stars in this episode. A psychiatrist supposedly commits suicide in "A Rage to Kill," but was it really suicide? Sergeant Reardon (Claude Akins) is identified as the suspect in the murder of a loan shark in "Mask for a Charade," and Mannix has to prove that wrong. A boxer is killed by a hit-and-run driver in "A Question of Murder," and his dying words identify the killer... and now a young boy who idolized the boxer seeks Mannix's help in proving it was murder. In "Trap for a Pigeon," Mannix gets entangled with the mob when he retrieves a stolen briefcase for a lawyer. The season ends with "The Ragged Edge," where Mannix goes deep undercover as a heroin addict to expose corruption on the police force. Linda Evans guest stars in this episode, and as an interesting side note, pay attention to the house where most of this episode is set... you'll see very clearly that they've invaded the house from The Brady Bunch! The packaging for the set is basically just like all of the previous releases. 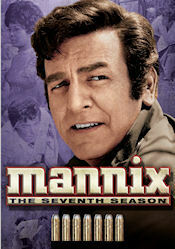 The cover art has a photo of Mannix, along with the series title and seven bullets to indicate the seventh season. On the back, there are a few episode snapshots, a photo of Mannix and his secretary Peggy, and a very brief description of the series. Inside the case are the six discs, which have just basic gray artwork with the series logo and a few "bullet holes" on each disc. Each disc contains four episodes. Imprinted inside the case is a listing of episodes, along with descriptions and original airdates. The menus on the set are very nicely done, as they have been on all of the previous releases. The main menu begins with an intro similar to the opening credits, while the theme song plays in the background. After that, there are clips from the episodes playing on the top half of the screen with a listing of the episodes on the bottom of the screen, along with options for Play All and Subtitles. Once you select an episode, it plays immediately. There are chapters at all of the appropriate places. Like a majority of the CBS DVD releases, the video and audio quality of the episodes on this set is absolutely pristine. The series has looked pretty good when shown in syndication, but the episodes presented on this set look great, with few problems aside from the expected occasional grain on screen. The audio is presented in mono, but is very loud and clear. Each episode on the set contains English subtitles for those who require them. There are no special features on this set, just as has been the case with previous sets. It would be nice if Mike Connors could be included in the special features, but he has been in somewhat of a dispute with CBS over these DVDs in the first place... so it would be unexpected to see any on any sets of the series (although he did do some stuff for the release of the first season). This is another fine release of the series, and it is especially great to see some of these rare episodes reappear for the first time. This is one of those series which seems to stay consistent over the seasons, without the series showing weakness as it ages. There is only one season remaining of the series, and just like the first season, none of the episodes from that season have ever appeared in syndication packages... so it will be even more exciting to see that one when it comes (which I think it will, it is just a matter of time). For now, though, I think fans will appreciate this DVD set. If you've never seen the series before (and I think by now, most fans have), it would probably appeal quite a bit to fans of other private eye series of the era (which were actually somewhat falling out of favor by this time, only to be revived just a few short years later with series like Magnum, P.I. and Simon & Simon), as well as action series such as Mission: Impossible. Ultimate Dallas (www.ultimatedallas.com) - Last week, TNT introduced a "new" series to many fans with their debut of Dallas, but fans of vintage television know that this series is hardly new, and is in fact a continuation of something which began on CBS over three decades ago (and when it ran there, it stayed on the air for nearly a decade and a half). In fact, both series continue to feature Larry Hagman and Patrick Duffy as J.R. and Bobby, the Ewing brothers. Ultimate Dallas is the definitive website for the series (and is being regularly updated as the new series progressing), dating back to the 1997. If you need to know something about the series, this website has everything that you'll ever need to know about it. Beginning with the episode guide, you'll find complete information about every episode of the original series, every reunion movie, and even every episode of the current TNT series. You'll even find an overview of all of the cliffhangers and reviews of the original series from critics here. If you are interested in the characters, you'll find complete biographies of every character of any level of importance, a Ewing family tree, famous J.R. quotes, and details of all of the women that J.R. ever slept with (particularly, his secretaries!). There are many other features on the website which we haven't even scratched the surface of here, so we suggest heading on over to the site to check out our Click of the Week.